Ask fellow campers about "Quinault Marina & RV Park" and nearby attractions. We went, we looked, and we left. Too close to each other and absolutely no appeal whatsoever. My husband said he wouldn't even go in the office! Many campgrounds are like this we have found in our travels. UGh! We would rather boondock in our 40' Tiffin Allegro Bus than most of these campgrounds. We camped at Quinault Marina & RV Park in a Motorhome. This place is a real dump of an RV park, very gross looking and run down. YES it is on the bay ocean and the jetty, but I could not recommend this to any one. Extremely run down lacking in up keep. We camped at Quinault Marina & RV Park in a Motorhome. The campground does have free showers in the bathrooms, but I didn't use the showers. I also noticed they have a laundry room, but I couldn't tell you if they work or not. Also, your first impression of the campground is not the best because it is right next door to a boarded up hotel. The entrance to the campground is in serious need of some TLC to be a little bit more inviting. I honestly almost asked my husband to turn around and take me back to town, but I'm so glad that I didn't. I loved being steps from the beach and hearing the waves crash all night. We camped at Quinault Marina & RV Park in a Travel Trailer. Highly recommend dining at Bennett's Fish Shack in Ocean Shores. The food was super! The line to order your food in the main area is very long, but if you sit in the bar area, you can order your food in there and they will serve you. It's all about the location. We were directed here by the manager of another area campground after my wife was dissapointed there was no ocean view there. This CG is right on the water, between a bay and the ocean. Miles of beach for walking. Not much appears to have changed since the last review in 2012. There is a friendly gentleman in the office that checks you in and appears to be the only person working here. A lot of deferred maintenance.however, water, 3oA, and sewer hookups work fine. No wifi or cable. If this place was full, the sites would be tight, but there are only 6 rigs here, so that's not an issue. I would come back if in the area again. We camped at Quinault Marina & RV Park in a Motorhome. Stop for supplies and firewood before getting here as there is nothing close by. The most amazing beach right out your doorstep. Probably the best beach in Ocean Shores. An average to low-end property, except for that amazing beach! The manager is a great guy. The property needs serious rehab, as do the utilities, but they worked okay. There's a dead hotel next door, lending a run-down atmosphere. Verizon cell works here, and a couple of TV channels come in by antenna. That's it. Nearest internet miles away in Ocean Shores. No trees, grassy sites, average room between the sites, a few full timers near the entrance, which I think are native fishermen. One irritant: lacking fire rings, people have made campfires wherever they want. There were 5 ash pits in our site: no matter how we tried to back in, we were walking in ashes, and the carpets, etc., suffered for it. Bring lots of tarps, I guess. Its all about that close by, clean, awesome beach. 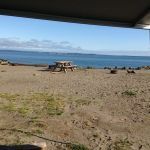 We camped at Quinault Marina & RV Park in a Travel Trailer. Are you affiliated with Quinault Marina & RV Park ?